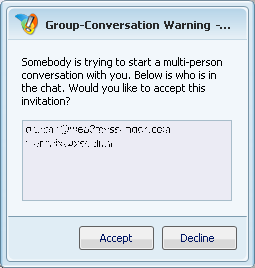 SamePlace is a standards-compliant, innovative, user-friendly instant messenger addon built on the Mozilla platform. 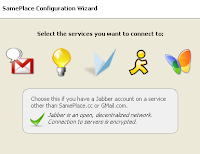 SamePlace currently supports Jabber, Gtalk, AIM and Windows Live Messenger networks. gSMS is a plug-in for Pidgin which notifies you by SMS when someone tries to contact you by Pidgin and you don't respond within a specified time frame. SMSs are sent via Google Calendar and it doesn't give you the actual text of the message. Just the name of the contact and the date / time the message was sent to you. If multiple contacts leave messages, they will be all bundled together and sent to you in one SMS. 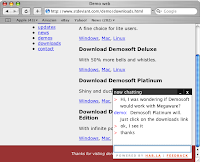 If you need help on installing gSMS, there is a great installing guide posted on makeuseof. 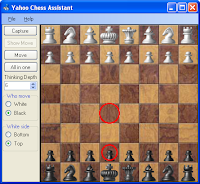 "Matrix mode expands on the tabbed conversations feature in Yahoo! Messenger for Vista. Tabs are handy for keeping your desktop free of multiple IM windows, but sometimes staying on top of all your conversations can be tricky. Hitting Ctrl + Alt + Shift + b on your keyboard will turn your tabbed conversation window into one single window with a matrix of boxes, each showing an IM conversation." FeedBlitz turns blogs and feeds into emails to subscribers. It reads your blog's RSS feed - a computer-readable form of your blog produced by all the blogging tools out there. It then figures out what's new and sends the updates to subscribers by email, instant messages. FeedBlitz has now extended its IM support (Skype and AIM) to include beta support for the Yahoo and Windows Live Messenger. Coccinella is a free and open-source cross-platform chat client with a built-in whiteboard for improved collaboration with other people. 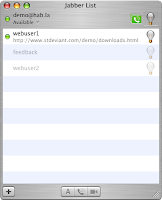 Coccinella can connect to any Jabber/XMPP instant messaging server. You can either use a public server, or you can deploy your own server. In the latter case, you can opt to federate your server with the public Jabber/XMPP network. 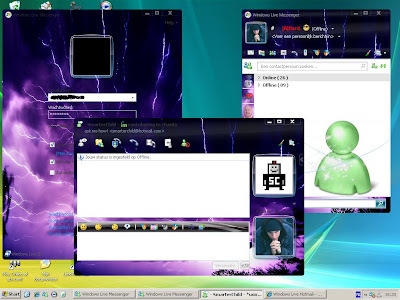 Coccinella can interact with other foreign instant messaging systems (ICQ, MSN Messenger and AIM) over Jabber. "Here we rate the 5 most popular instant messenger applications, (AIM, Yahoo Messenger, MSN Messenger, Google Talk, and Skype) in 6 categories: Instant Messaging, Voip Calling, Extra Features, User Interface, Memory Usage, and Ease of Removal, and give you a totally objective review! We had 3 users of different computer knowledge levels rate each application. Admin: Using a Logitech USB Headset 250 on an AMD Athlon 64 X2 2.1Ghz processor with 2GBs DDR2-800 RAM. Internet speeds are 3.0 Mb/s download and 768 Kb/s upload. Expert PC user. Digit: Using a Philips SBC HN110 noise-canceling headset on an AMD Turion 64 X2 CPU @ 1.8Ghz/core and 1GB of DDR-667 RAM. Internet speed is 7 Mb/s down, 512 Kb/s up. Expert PC user. GirlG33k: Using a Pentium III 500 MHz processor with 512 MBs of RAM. Internet speeds are 3.0 Mb/s download and 768 Kb/s upload. Above average PC user. Here’s what each had to say:"
This pack includes 30 emoticons created by Microsoft. Download emoticons directly to Messenger. "Many people are discovering a new way to network and to build a community online Web 2.0 style in instantly interactive groups via Skype. Continue reading : How Do I Promote My Skype Room? As you all know Yahoo! Messenger has a feature called Invisiblity. It means that your buddies can hide from you by changing their status to Invisible, that way you think they are offline. 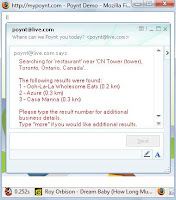 Using Invisible.ir you can find out if your buddies are Online, Offline, or Invisible. "While social networking Web sites such as MySpace and Facebook have been singled out as places where teens could face sexual harassment, most of the unwanted solicitation actually happens in chat rooms and via instant messaging, a new study finds. Even there, only 15 percent of children experience unwanted sexual solicitation and only a third report being harassed online, according to a new study in the February issue ofPediatrics..."
"The Apple TV isn't just getting Cupertino's updates, apparently. According to aficionados of the little silver box, a Canadian teen who has hacked his way through a wireless keyboard workaround and a GPS plugin used for an in-car Apple TV setup, is developing a native Skype client for device. Brandon Holland, the hacker in question, says that the plugin will take advantage of the Skype API, and will allow a user to make calls and send text messages using a standard USB headset or USB phone..."
Continue reading : Native Skype coming to Apple TV? MusicTracker is a plugin for Pidgin. 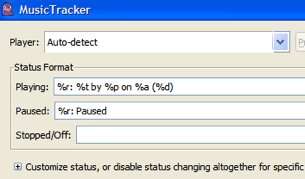 MusicTracker displays the music track currently playing in the status message of various accounts such as AIM, Yahoo, WLM, Google Talk (Jabber), etc., i.e. any protocol Pidgin supports custom statuses on. Support for a wide range of audio players on both Windows and Linux platforms is planned. MusicTracker currently supports following players: Amarok, Rhythmbox, Audacious, XMMS, MPC/MPD, Exaile, Banshee, Quod Libet on Linux. Winamp, Windows Media Player (9+), iTunes, Foobar2000 (incomplete support) on Windows. * Allows you to customize the status string with various fields extracted from your media player such as artist, album, track, duration, progress bar, etc. 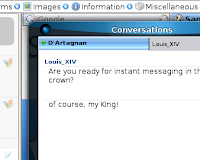 * Works around Pidgin's lack of support for MSN status messages by using the nickname instead. 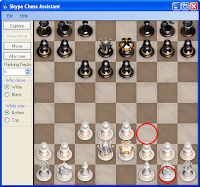 * Different status messages for various media player states such as Playing, Paused and Stopped. "When Michael profiled the Gizmo Project in July 2005, he noted that it had more features than Skype, but lacked instant messaging. The one time Skype competitor has become the Jaiku to Twitter, having pretty much dropped off the radar as Skype was acquired by eBay and went on to become the leading desktop VOIP/ IM solution. 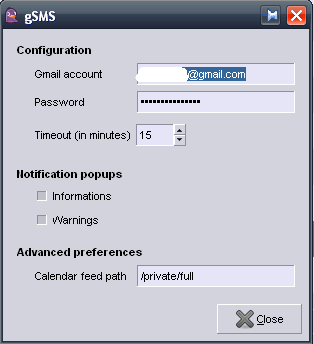 The open source SIPphone owned Gizmo has continued to be developed, and this week added MySpace IM support on top of support for MSN, Yahoo, AIM and Jabber (including Google Talk). Today’s Gizmo is more IM platform than predominantly VOIP platform, and it makes for a fairly decent product..."